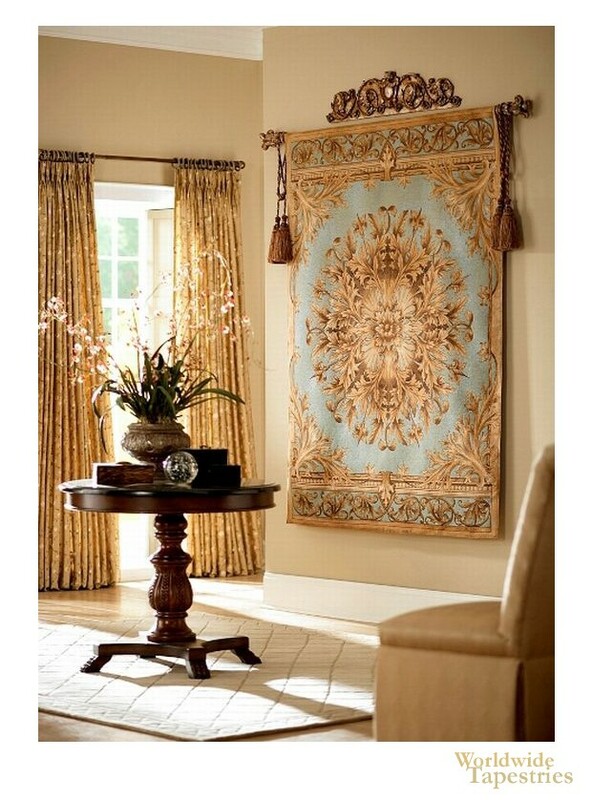 This lovely tapestry "Grand Baroque Aqua" shows a floral and foliage motif design in beige, earth tones and aqua blue. Full of beauty, this piece shows the decorative designs inspired by a combination of French florals and verdures, and Oriental and Persian art. The central motif is reminiscent of a flower opening or the rays of the sun, is both organic and geometric in feel, at the same time. The detail and artistry in the leaves are wonderful. The border is beautifully ornate and contrasts wonderfully with the aqua blue in between. This wall art tapestry "Grand Baroque Aqua" is backed with a lining and has a rod pocket for easy hanging. Note: tapestry rod, tassels, and accessories, are not included in the price.